Was there some mistake? I had just arrived at the train station in Beziers, a large medieval town set upon a towering ridge in the Languedoc-Roussillon region of the South of France. And I was feeling a little confused. I’d heard a lot of contrasting information about Beziers. Some people insisted that it was a dispirited, neglected town whose saving grace was its medieval core. Yet I knew that it was home to a number of expats who raved about its charms. So, which was it? With the words “neglected” echoing in my ears, I left the train station only to find myself facing the Plateau des Poetes, a lovely park bursting with deep green pines and flowerbeds set with daffodils and white tulips. The large pond at the park’s center had a family of ducks gliding on its surface, while a swan or two nestled on its banks. Not dispirited. Not neglected. In fact, even though I’d just arrived, the park was so tranquil it made me want to settle on a bench with a good book. And that’s what I did. I pulled out my guidebook and set about readjusting my expectations of Beziers. After I wrenched myself away from the park bench, I headed toward downtown, encountering one delightful scene after another. 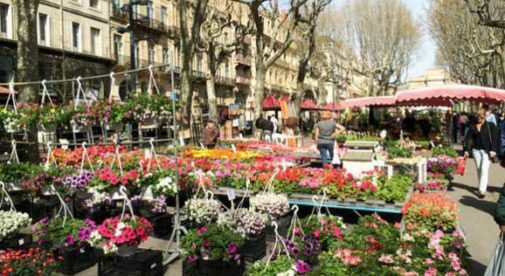 By chance, I had arrived on a Friday, the day of Beziers weekly flower market. This meant the entire length of the Allées Paul Riquet—a long, tree-shaded esplanade lined with shops and cafes—was smothered in hundreds of brightly-colored blossoms. A saxophonist wandered around playing jazz standards, and the mood was downright festive, as locals inspected the flowers and chatted with the vendors. As I made my way to the medieval quarters, Beziers continued to give the impression of being a perfectly agreeable French city, filled with boutiques, restaurants and shops, and even the chic Parisian store, Galleries Lafayette. Locals seemed friendly and cheerfully helped put me back on the right path when I got lost. By the time I started exploring the old town, I was firmly on the side of those expats who sang the praises of Beziers. If the modern town was agreeable, the old town was superb. Like so many French old towns, this one consisted of a maze of little streets, many cobblestone, lined by beautiful 19th-century buildings and an assortment of little shops. The medieval quarter has a number of “don’t-miss” items…I wandered the excellent food stalls of Les Halles, a glass-iron-and-brick market hall. I also visited the Eglise de la Madeleine, the infamous site where 7,000 people were brutally massacred during the Crusades—now a simple stone church adjacent to a peaceful square. My favorite experience, however, was carefully winding my way down the town’s steep slopes to the “Pont Vieux,” the 12-century stone bridge, whose graceful arches cross the River Orb. The bridge offers an absolutely stunning view of Beziers perched on its rocky ledge, crowned by the massive stone façade of the 13th-century Cathedral St. Nazaire. With time running out, I climbed back up the hill to catch the views of the Beziers countryside from the high point of the Cathedral grounds. I was not disappointed: the landscape, with its wide grassy stretches and winding river, is nothing short of pastoral perfection. And it’s not only the scenery that’s appealing. Property prices in the Beziers region are very reasonable: a small, renovated, two-bedroom house with a garden can be yours for around $110,000. As I gazed at this bucolic scene, I reflected on the expats who were living out there, enjoying such beauty and proximity to this charming town on a daily basis. And I thought: How lucky.